I've been looking forward to The Vanishing of Ethan Carter from the moment I first heard about it, and so after more than a year of waiting I was very excited to watch the debut teaser trailer that came out a little earlier today. And having watched it, I am even more excited than I was before – and also more than a little disturbed. 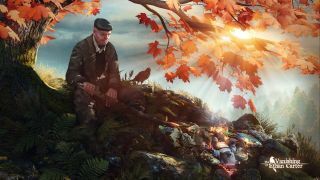 The Vanishing of Ethan Carter is a "weird fiction horror" game, as the developer puts it , in which you play as an occult detective investigating the disappearance of a young boy. That in itself is enough to hook me, but the fact that the studio behind it, The Astronauts, is headed by the original founders of People Can Fly—the guys who did Painkiller and Bulletstorm —just makes it all the better, because by all appearances it's so completely removed from those games. Given The Astronauts' blook-soaked heritage, it's ironic that the violence in this trailer is so much more disturbing than anything I've seen in either of those two ridiculously murderous shooters. I've killed thousands of dudes in both games in a variety of creative fashions, and I don't recall ever wincing at any of it the way I did at the end of this video. I had no idea what to expect from it, but it certainly wasn't this level of sheer brutality. It's gorgeous, too, and captured entirely in-game in real time, but for some reason I don't think the sweeping vistas and realistic water and tree effects are what people are going to be talking about. I mean, did you see the way that guy's head bounced? Wow. Disturbing or not (and let's face it, there is no "or not" option), I'm looking forward to this game now more than ever. The Vanishing of Ethan Carter is scheduled to launch for the PC in the third quarter of 2014.